Buy Firewood Direct Online - Bulk Kiln Dried Logs For Sale - Free Delivery. Want to save some money? Well if you buy Firewood you can by bulk buying direct and not in small quantities. If you’re economically minded you’ll know that it makes more sense to do a big monthly food shop rather than running to your local shop to buy food and ingredients every time you’re hungry. Not only does it save money to buy in bulk but you’ll never get caught short when life’s little obstacles crop up. You can also save an awful lot on petrol or commuting charges by minimising smaller trips. Let’s apply that logic to your heating supplies – firewood, to be precise. 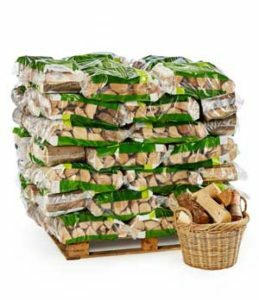 Buy firewood direct and in bulk – rather than making the pilgrimage to your local petrol station whenever you find yourself short of wood. Not only do you save yourself money, but time as well – a short walk to your log store beats a cruise down the dual carriageway to the nearest Esso. The wood you buy at your local service station or store is also expensive because it’s priced for convenience. The powers that be know that anyone buying wood there needs it in a hurry, so they’ll likely be happier to pay more. It’s the same thing when you buy a sandwich at a train station. It’s usually more expensive because commuters simply don’t have the time to shop around for a better deal. Look at it this way. Let’s say that you’re wanting to use your woodburner throughout a month. Let’s pick November. Days you’ll want to burn wood – we’ll go for 26, as you’ll no doubt be out some evenings. Average small bag of wood – £8. So, to keep your home nice and toasty you’d need 13 bags of wood. 13 x 8 = £104. Keep that figure in mind for a second. Buy firewood from local stores and 70 bags would set you back £560. That’s not even taking into account the prices you’ll pay to drive to the shop. Plus, burning inferior quality firewood can damage your log burner. It also burns very fast, meaning you can sometimes use twice the amount. Buy logs online from us – they burn longer and they’re better for you log burner or chiminea. The standard cost for servicing one of these is around £100 (not to mention any repairs needed) – and that’s a charge you could do without. Not only that, but if you buy firewood direct from us we’ll deliver it to a location of your choice for free. A lot of retailers ask you to spend over a certain amount to get free delivery – but not us. All of our bulk logs for sale will be delivered for free. So, to summarise, the logs that you buy from local petrol stations and DIY stores are only a short-term solution to your heating problem. Like putting a band-aid over a water leak – you’ll be back to square one shortly. Not only that, but the wood can often be poor quality and damp. This will damage your log burner over time and, as we found out, having your stove serviced isn’t cheap. Whereas, our bulk logs for sale will save you money – nearly £200! What could you do with £200…? Flights to somewhere exotic, I’m thinking! You’ll also be buying a premium grade product – one that will last longer and one that won’t damage your log burner. You can also get free delivery. Here at Firewood Fund we’re dedicated to finding you the best solutions for keeping your home warm. Buy logs online with us for a great deal, and free delivery. We also offer the world’s first firewood subscription service. You simply save away each month, in nice manageable chunks, and then when you’re ready for your wood we’ll deliver to any UK address for free. At a time and on a date that suits you. Click a firewood product below for some more information on how you could make life even easier and tick off another one of life’s little problems.